Highway 43 is part of the CANAMEX TRADE CORRIDOR a 6,000-kilometer network of highways running from Alaska to Mexico that supports growing trade links between Canada, the United States and Mexico. The Alberta Government partnered with the Sturgeon Lake Cree Nation to complete the last section of roadway twinning within the corridor. Together with Petrowest Construction LP, Carmacks liaised with STCN, attended bi-weekly meetings, hired band members during construction and participated in various functions held by the band during the course of construction. 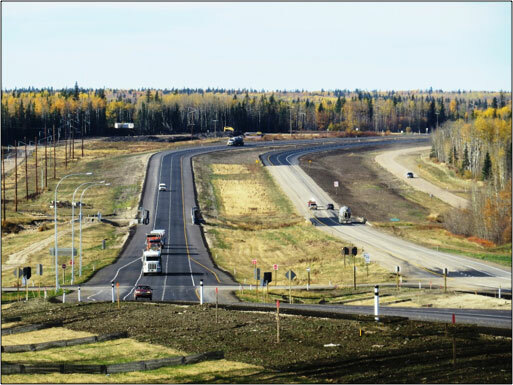 The scope of the work for this 20-kilometer of new four-lane roadway through the Sturgeon Lake Indian Reserve comprised of grading, granular base, paving and bridge construction and various intersection and transition construction. The key components of the work were the construction of two bridges, one pedestrian overpass, 3,000,000 cubic meters of excavation, 500,000 tonnes of granular base course and 138,000 tonnes of asphalt pavement on portions the new eastbound and westbound lanes through the Sturgeon Lake Indian Reserve.